At the end of the day, Ranveer Singh is perhaps just another guy who wants to pose handsome beside his bride Deepika Padukone. 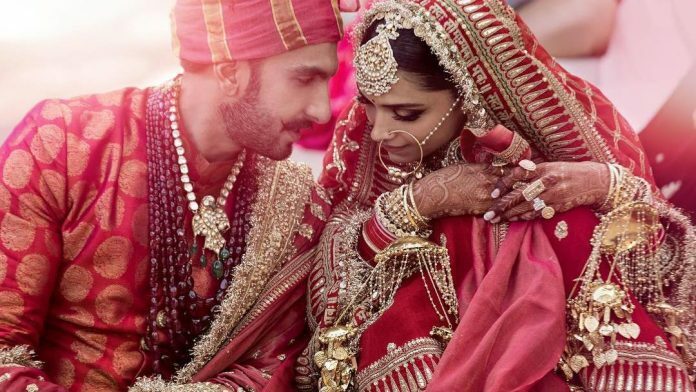 The nation can heave a sigh of relief as the much-awaited official wedding pictures of Bollywood actors Deepika Padukone and Ranveer Singh, or Deep-Veer as they are fondly called by their fans, are finally out. Both look dashing and loving in the frame. However, what really stands out is a fashion-tamed Ranveer Singh. Hailed as the fashion’s wild child, Ranveer Singh has made outrageous look cool, from sporting a ghagra with handle bar moustache to blinding the paparazzi cameras with neon clothes. He nurtured the quirk in his wardrobe under our adulation’s shade. Naturally, netizens had high hopes from his wedding attire. But his pictures jerk us back to reality and tell us that he is just another guy who wants to ‘pose’ handsome beside his belle in an Italian villa. There’s no place for neon clothes in this setting. Deepika and Ranveer were both dressed in Kolkata-based designer Sabyasachi Mukherjee’s creations and stuck to the wedding staple of gold, white and red. For the Konkani ceremony, Ranveer looked quaint in a white and gold dhoti-kurta while Deepika wore a heavy Kanjeevaram with equally heavy gold jewellery. Wearing heavy jewellery through long shooting sessions for Padmaavat seems to have paid off well for Deepika as the actor was seen giggling away at the wedding. Any regular bride would have been weighed down by so much jewellery. In another photo, said to have been clicked during the Sindhi wedding, the couple is dressed in bridal red from head to toe. The two seem to have given specific instructions to Sabyasachi for the heavy-on-tradition outfits. Virat Kohli and Anushka Sharma’s wedding attire last December had proved that the designer can craft fairytale looks even with an unlikely bridal palette. Going by her past fashion appearances, Deepika is known to root for the conventional but one can only wonder as to what made Ranveer Singh’s fashion sense so docile. He dashed the hopes of Twitterati who were expecting Ranveer to go bonkers on his special day. Remember the lehenga memes just after Ranveer-Deepika’s wedding announcement? It is safe to say that on the day of the wedding, Ranveer chose to be the backdrop for a gorgeous Deepika in the frame (as is usual for most grooms all over the world). He might have finally taken heed of Deepika’s ‘tolerance’ for his flamboyant and flashy wardrobe. After all, every good marriage starts with listening to your partner. But as a dedicated nation of celebrity stalkers, we can only hope that Ranveer doesn’t distance himself from his experimental personality. It is what sets him apart from the always-prim-and-proper Bollywood crowd. Here’s wishing Ranveer and Deepika a happy married life with more fashion adventures.